This is the story of the people of the book. The people? Israel. The book? The Bible. Surprising as it may seem the Bible uses only the brief space of it's first eleven chapters to narrate the mighty processes of creation...plus approximately two thousand years of history which includes such tremendous events as paradise lost the rise and fall of empires and the deluge. Beginning then with Genesis 12 it requires 1178 chapters to record one man's destiny...the story of Abraham and his family. It is true that other peoples are mentioned in the Bible not for the purpose of giving their history but only as they deal with oppose or influence this one man's family. Here then is the biography of the family whose remarkable destiny the world has yet to understand and to reckon with. These are the people who comprise the determinative ingredient in that greatest of all romances the world drama of history. In the hands of this devoted author the race of the Book lives through the pages of One Man's Destiny with clearness: from Abraham Isaac Israel then forward through the intervening centuries to America. And the centuries do not blend and blur but take their positions in their foreordained and previously recorded pattern all the way to Israel's position in the world of today and tomorrow. It is the story back of the story of America. It is the national story of the Bible which needs to be told...and told often. 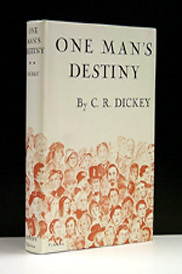 One Man's Destiny The story behind the story...of America! 5.0000 out of 5 based on 1 ratings. Only 334 pages, but you will wish there was more from this author.A Very Easy read that flows very smooth.I Highly recommended this for the beginner.Big scores here for this book!